Active Children Portland keeps children active in their club, classroom, and community. Programming is an active and holistic approach to childhood development, which includes sports, creative writing, nutrition education, and service learning projects. Active Children Portland’s mission is to empower students to lead healthy lives, succeed academically, and inspire positive community engagement. The organization began in 2011 with the vision to transform communities and serve hundreds of local students through youth sports. Active Children Portland program participants receive programming 30 weeks a year, 4 days per week, which keeps them active, healthy, and engaged in a positive and stable after-school environment. Our programs focus on helping all participants to develop the confidence and life skills they need to succeed. We believe that by taking a holistic and comprehensive approach to youth-development, and by focusing on kids who need it the most, we CAN make a positive difference for the next generation. Today, Active Children Portland delivers 30 weeks of after-school programming to over 600 under-served, urban elementary and middle school students at eleven different sites throughout the Portland metro area. 97% of the children enrolled in our programs qualify for free or reduced lunches. 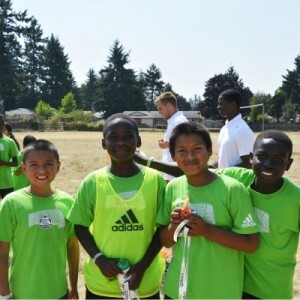 In fall and spring, we engage youth through America SCORES and Soccer for Success (US Soccer Foundation) programming, which integrates soccer, creative writing, nutrition education, and community service projects. In January 2014, we expanded our winter programming to include PeacePlayers International, a peace building and leadership development curriculum that uses basketball to bring children together and teach proven tactics for improving their communities. The America Scores program encompasses soccer, creative writing, and service learning, to inspire urban youth to lead healthy lives, be engaged students, and have the confidence and character to make a difference in the world.